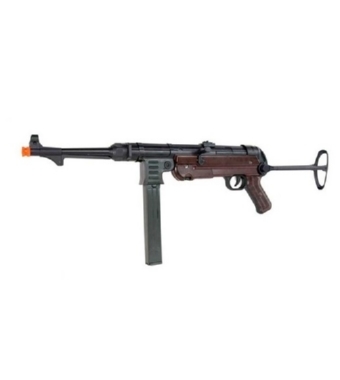 PRODOTTO DALLA AGM, FUCILE ELETTRO MP40 VERSIONE III GENERAZIONE. FULL METAL, CARICATORE 70PZ, MODALITÀ D'AZIONE A COLPO SINGOLO E RAFFICA, PALLINO 6mm (CONSIGLIATO 0,20/0,23/0,25), GITTATA MASSIMA DEL TIRO CIRCA 40-50mt. BATTERIA IN DOTAZIONE MINI TYPE 8,4V-1100mAh, CARICA BATTERIA 220V-300mA. CALCIO RETRATTILE IN METALLO, GUSCIO CENTRALE IN ABS COLOR RADICA.